From the 1st edition Advanced Dungeons & Dragons Monster Manual (1977), p11. 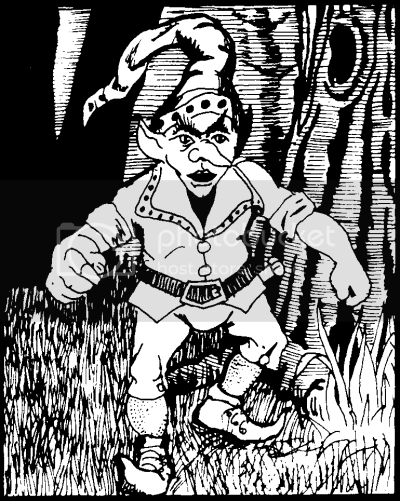 Brownies are distant relatives of halflings, (perhaps half halfling, half pixie) but they are smaller and far less common. They are basically friendly to humans and their ilk (dwarves, elves, and halflings), but because they are shy, they are seldom seen and favor quiet, pastoral areas in which to dwell. If encountered on friendly terms, brownies can often (50%) be convinced to help lawful good characters. They are able to make or repair items of wood, leather, metal, etc. with ease. They are also good guides. Brownies can use the following spells once per day: protection from evil, ventriloquism, dancing lights, continual light, mirror image (3 images), confusion, and dimension door. Brownies do not usually carry weapons other than short swords. They have exceptional senses in general, are never surprised, and have 18 dexterity. Brownies are capable of blending into the landscape very quickly, in effect using natural cover and speed to become invisible (and escape if desired). Besides their own language and the alignment tongue, brownies speak elvish, pixieish, and the language of sprites and halflings. Maybe it was illusionists then? I remember something about my character being off-the-book. I think I have a 2e PHB still. Not sure though. Never really got into it, as 3e came out shortly after I started playing with those guys. Maybe it was illusionists then? It was preferred class of gnomes. I like much more 1E gnomes too - they were more "faerie" race. Hmm... I am going to have to get out the 2e PHB now. What the heck was it that my DM was complaining about? I definitely remember gnomes now, as I had the halfling/gnome book (the fake leather looking ones for 2e).